Welcome to Table Talk Math. This week, we're talking about clotheslines. "Hey kids, I need your help putting these numbers in order. Do you think you could do it for me?" On the table next to me is a stack of sheets of paper folded in half with a number on it, ready to be put onto the clothesline that is strung up between two dining room chairs. Yes, this is a twist on the traditional number line activity and can be accessed by young children. Yes, this is an elementary lesson. Yes, this can be a quick conversation. However, over at clotheslinemath.com, there are ideas aplenty for children of all ages, including high school students.Chris Shore has built a variety of clothesline ideas for middle and upper grade levels, so please take a look! 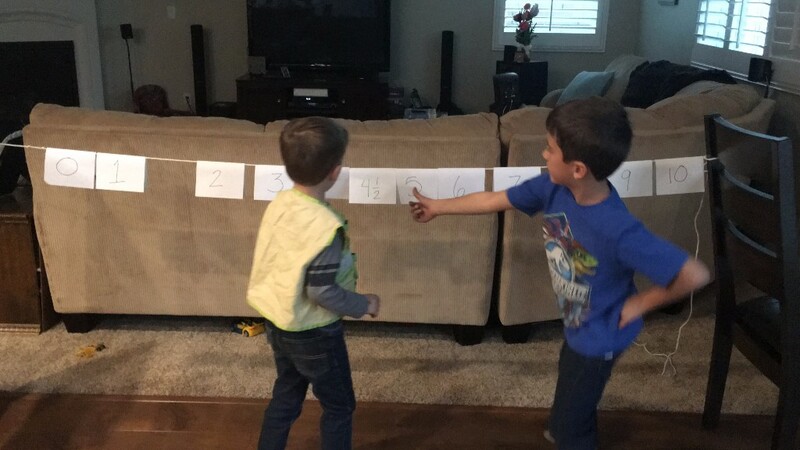 My boys spent around 5 minutes noticing, wondering, and exploring the number line by sliding sheets of paper across a string, spacing them out accordingly as more information became available. Because it was happening so fast, I wanted to throw a minor wrench in the system and did so with the 4 1/2. Even though he hadn't been introduced to fractions, it didn't take long to figure out that the 4 1/2 fell neatly between the 4 and the 5. When they get older, we will head over to the clothesline math website and find more ideas and information to support both boys, but a clothesline will certainly be a part of our discussion for years to come. If you want to see my boys go through the progression,it's here.